Chandler toured with Anne Feeney for a couple of years recently, including a stop at Cousin Andy's in Carbondale. For the Redbud Hill show, his side man will be local musician and Redbud Hill owner Randy Auxier. "Chris isn't only about politics by any means, but he doesn't neglect that subject. His poetry is often political, in part, but I think I would describe his message as one of compassion and hope, situated in broad cultural reflection and criticism," Auxier said. "It isn't simple-minded leftist simple politics. He asks who we are, what we value, why, and how we can become better people. "When Chris points a finger, it's usually at everybody, including himself." For more information on the Redbud Hill concerts, call 565-1238 or go to www.redbudhill.com. 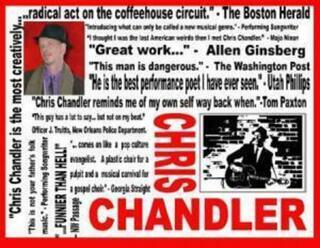 For more info on Chris Chandler, go to www.chrischandler.org.